I simulate present and future climates in plant growth chambers, where large numbers of seedlots can be tested quickly and affordably. This has been done with interior lodgepole pine, interior spruce, western larch and western redcedar. The growth chamber approach allows us to test climate conditions which are not or not yet present in the BC landscape, avoiding the risk associated with extrapolating too far from field data. While seedling response is very plastic, genetic differences are apparent and tend to correspond to those we find in long term wide range provenance trials. Plants respond positively to increased average temperatures even in already-warm climates. It is extremes in temperature and drought, combined with competition, which are responsible for the mortality that causes the downward trend in growth response curves at higher temperatures. The impact of extremes in turn depends on the background of the averages. The effect of CO2 concentration on growth is similar for different seed sources: even under drought, no rank order change among seed sources has been revealed. While midwinter conditions and disease occurrence cannot be included in these tests, seedling weakness caused by a misfit with climate regime will predispose plants to further damage. 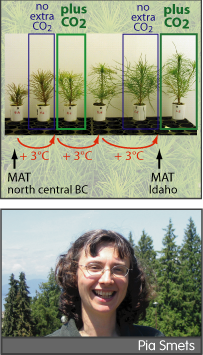 Presently, simulated climate regimes are being used in the AdapTree project, where the usual growth traits are combined with phenology and heat-, drought- and cold tolerance observations to yield an overall phenotype that will be linked to the genotype for each individual.